Are you interested in a way to get out of the middle of a couple's conflicts and work with both partners at the same time? One important and powerful aspect of our Developmental Model is the Initiator-Inquirer process for effective communication. The guidelines are simple, but the process is rich, and quite revealing. It can be used with couples at all of the different developmental stages. In the “I-I” process, there are 2 roles, the Initiator and the Inquirer. At first glance the roles sound easy. It might even be tempting to think of these as mainly Rogerian reflective listening statements. However, the roles are more complex and are designed to aid both partners and the therapist. This process stops the “who will be attended to” competition, since the roles are delineated ahead of time. The roles also give partners specific skills to learn and apply so they can manage their own emotional volatility during tense discussions. For the therapist, watching partners function in these roles provides a very explicit window into each partner's level of differentiation. You can fine-tune your interventions based on each partner's level of development. For example, Hostile-Dependent couples break down very early in the process. In this case, the breakdown indicates where you want to focus so you can help them strengthen their own boundaries and self capacities. This growth will help them be a much more effective partner. 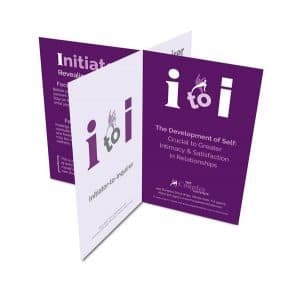 When you teach this process to a couple, they can work with it on their own especially if they have their own Initiator-Inquirer guide cards at home. Repetitive sessions with the Initiator-Inquirer process help each partner build their capacity to not take things so personally. This is especially important when a partner is regressing in the Initiator role. When the Inquirer is able to do less self-referencing and is able to tolerate some regression in their spouse, the cycle of defensiveness will be contained. The Inquirer can become curious and ask questions which then help the Initiator process their own regression more successfully. As you become more familiar with the Initiator-Inquirer process, you will find a variety of ways to creatively apply it by varying the emphasis so it is appropriate to each client's sensitivity or developmental level. If you're not already using the Initiator-Inquirer process, I urge you to try it. It's probably the most widely used of all our interventions. Its potential to simultaneously promote self-discovery, intimacy, and growth makes it a powerful tool for you and helps create soothing moments that are new to your clients. 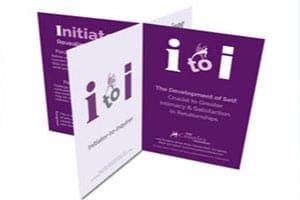 You can get your own pack of 25 I-I guide cards to give away to clients when they are learning and practicing the I-I process. Many therapists emphasize that the cards provide a needed anchor for their clients and are their secret ingredient for success with the process. Tha I To I process continues to be my favorite after many years of use. Thank you for the review Ellen!